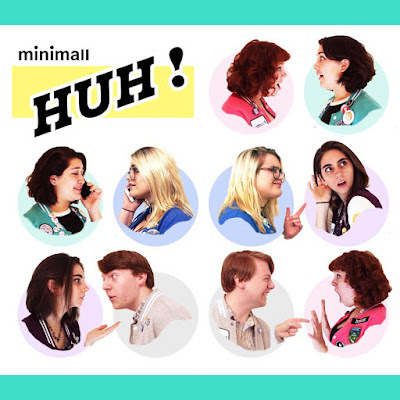 The Le Sigh: Premiere: Minimall - "Don't Tell Me"
Premiere: Minimall - "Don't Tell Me"
Listen to the first single from Minimall's debut EP. Last year, I saw Angel Olsen on tour for My Woman, and one of my favorite parts of her set was that her band was all in kitschy uniform. Each member wore a baby blue suit, adding a layer of performance that was reminiscent of the doo-woop and girl groups of the fifties and sixties. Los Angeles-based five piece Minimall might not have taken their queues directly from Olsen, but they follow in a similar vein. The band dons matching pastel bomber jackets when they perform as if they're LA's coolest harmonizing quintet. The attire is the aesthetic representation of their sound - sugary sweet and poppy, but with a slight hint of attitude underneath the surface. "Don't Tell Me" is the first single off Minimall's upcoming debut EP, HUH!, which will officially be out June 16th. Vocalist Wynne Males kicks off the track while deadpanning, "I was missing you before we even met." The line implies a swooning romance that's about to ensue, but that's not exactly the case. As Males continues to sing, we learn the true nature of the subject at hand, and it's not as peachy as their smooth voice or the bright synths popping off in the background. Listen to "Don't Tell Me" below and stay tuned for more from Minimall. "It cuts deep to realize that someone you thought was a good person really isn't at all. An internal battle will wage itself in your mind as you try desperately to ignore all the evidence, but I can attest that it does help to work through it by writing a song like 'Don't Tell Me.'" Listen to Minimall on soundcloud.